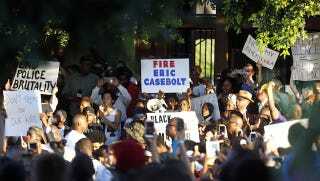 On Monday night, people in McKinney, Texas took to the streets to protest Corporal Eric Casebolt, a police officer who brandished his gun at a pool party and waved it at some teens while sitting on the back of a black girl. Literally. As a result, he’s been suspended—but not fired. Noted, Texas. As Jon Stewart covered on The Daily Show on Monday night—to add to other things one can’t do while black without being arrested, like cheer for your family at a graduation—a teen threw a pool party at her local swimming pool in her neighborhood where she had a pass. Then it was besieged by cops because others at the pool complained about the noise. Tatiana Rose, one of the teens who threw the party, says that some white adult pool attendees called them racial epithets and hit her in the face. Here is the event’s account from 15-year-old Dajerria Becton, the teen who was slammed to the ground in the clip, via Fox 4 in Dallas-Fortworth, Texas.